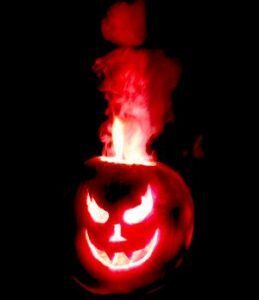 The red flames shooting out of this Halloween pumpkin come from a strontium salt. Use a real pumpkin, not a plastic one. Plastic would melt. The flare is a source of strontium nitrate. Strontium emits red light when it is heated in a flame. Use the type of flare that you strike, not the kind you shoot from a flare gun. Flares are sold with emergency equipment for camping, driving, etc. Cut or break the striker off of the flare. You don’t need it. Take the ‘lid’ off the jack o’ lantern. This helps feed the fire oxygen. Place the roll of toilet paper inside the pumpkin. It will act as a form of wick, helping the fire last longer. Insert the flare inside the center of the toilet paper roll. It doesn’t really matter which side is facing up. Pour kerosene on the toilet paper. Try to fully saturate it. When you’re ready, use a lighter to ignite the toilet paper. I suggest a long handled lighter because it’s easier to reach inside a pumpkin with one, plus it’s safer. If you need to extinguish the flames, you can put the lid on the pumpkin or douse the interior with water. This is a fire project, so adult supervision is required. Perform the project on a fire-safe surface, preferably outdoors. Not that you would, but don’t eat the pumpkin after performing the project. The strontium nitrate isn’t all that toxic, but kerosene is completely inedible. Burning it releases smoke.